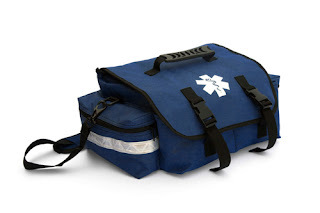 EMT Medical Co., Inc.: FIRST RESPONDER KIT (116 PIECE) ON SALE! Regularly $71.95, now only $64.75! EMT FIRST REPONDER KIT 116 PIECES: Ideal for home, office and car. Contains the essential items for any emergency situation. Bandages and Dressings: 2 8x10 Sterile ABD Pads, 2 7x9 Sterile ABD Pads, 1 Dyna Stopper Trauma Bandage Sterile, 1 1/2" Cloth Tape, 1 1" Cloth Tape, 2 2" Sterile Gauze Bandages, 1 3" Sterile Gauze Bandages, 1 4" Sterile Gauze Bandages, 16 3/4x3 Adhesive Bandages, 16 1x3 Adhesive Bandages, 3 40x40x50 Triangular Bandages w/pins, 1 3" Elastic Bandage, 5 4x4 12 ply Sterile Gauze (2/pk), 10 2x2 Sterile Gauze (2/pk). Measures: 18" x 8" x 9"
Sale from 7/24/13 - 8/18/13.